“For five years I cried through every appointment I had with the psychiatrist. I just sat there and cried. As I sobbed, all I could talk about was my horrible, miserable life dealing with depression, bipolar, schizophrenia and eosinophilia myalgia syndrome. Afterward he would write me a prescription for some more medicine and I would go home and get back in the bed. “I took myself off all medicines after one month of being on the supplemental program that Optimum Health put together for me. Though Tianya advised me not to go off my medicines without the psychiatrist’s approval, I knew I didn’t need them anymore so I weened myself off the drugs. I was up and functioning by 6:00 am consistently and I slept good at night too! Four months later I bounced into my psychiatrist office happy and full of life hoping to stay off all of my medicines. After officially taking me off all the medicines, he actually told me to make sure I stayed on my supplemental program that Optimum Health had developed for me! When I took my supplements, I was wonderful, life was wonderful and I really didn’t believe that I had any of my conditions any more. I no longer became inflamed with bouts from the eosinophilia myalgia syndrome no matter what I ate or was exposed to. One of my daughters told Tianya that she had stolen me from them because I was never home for them to come and check on anymore. Feeling Great Again Had Its Down Side! “Unfortunately, the supplemental program was hard for me to afford as I had to purchase them myself. Insurance would pay for the drugs that were ineffective, but not the supplements that gave me my life back. Each time I could not afford my supplements and had to go back on the drugs, the problems began again. At one point around 2004, I couldn’t afford Optimum Health’s assistance for 4 years. This meant that I was back on the drugs for 4 years. I ended up on one drug that had me like a zombie shaking all the time. It was as if I was retarded. I even needed assistance walking. Much from that period of time is lost to me due to my memory issues. Eventually, I got a new psychiatrist and she changed my medicine. I began to do a little better but I was still a zombie. Finally, Tianya called me to say that she thought she had found the source of my problems…TOXICITY. She thought that toxicity might be why I needed so many B vitamins to keep me happy. She also said that she thought that she had found a way for me to afford my supplements. I returned to Optimum Health and began the total body detoxification right away. The results were amazing. The inflammation on my eye that had developed during that 4 year period decreased by more than 50% within 15 minutes of my first detox. People began to tell me that I looked so much better. I got off of a lot of my medicine in about a month so I wasn’t being led around by the elbow like a zombie anymore. I have detoxed so much metal, nicotine and debris from my joints, gall bladder, lungs and urinary system over the last 6 years that it is hard to believe. Tianya said that the metal in my jaw may constantly putting more metal in my body. That may be why I have to keep detoxing so much. Finances continue to be a problem. Optimum Health works with me to make my detoxing and supplements as affordable as possible. I recently noticed that my regular urinary tract infections had stopped returning every few months. Wow, my kidneys really are doing better! I also notices that it doesn’t hurt to be touched anymore and my daughter said, “I have my mom back again!” With the newer medicine, detoxing, and the right supplements, I have a full life again. 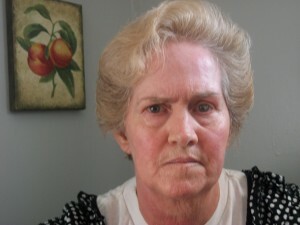 Virginia has not had any issues with eosinophilia myalgia syndrome or schizophrenia in about 7 years. She continues to need high amounts of B complex and get into major trouble even ending up in the mental hospital if she goes off of her supplemental program. As a result, Virginia remained afraid to try to get off of her medicines. In 2012, Virginia received a free appointment with Amber Terrell, MSW as a part of Amber’s interview to become a health kinesiologist at Optimum Health. Amber accurately determined that the movement of energy through Virginia’s brain needed to be corrected. After making the corrections, Virginia began to thrive in a way that made it obvious that her actual problems were finally being addressed. Virginia has seen Amber regularly for nearly a year and she no longer needed large amounts of B vitamins to be happy! 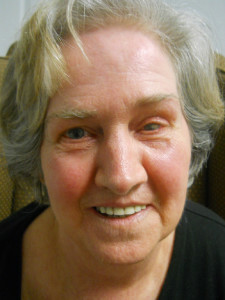 She says, “I am so happy, I want to live!” Virginia actually went off of her supplemental program and continued to be happy! Yes, her underlying cause is finally being addressed! We at Optimum Health are theorizing that correcting the flow of energy through Virginia’s brain allowed her brain to utilize the B vitamins correctly decreasing the amount that she needed. Though we don’t really understand the science behind it yet, we are thrilled to be on the right track to deal with the underlying cause! Virginia’s body can heal and let her be the happy woman she truly is!